Well, football fans, it's over. For months I come into work Monday morning to hear the the banter about the weekends games. My boss is for the Cowboys. Everyone else in Fairfax is for the Redskins. I'm so sick of football. I mean... go team! Last night, the clash between the Steelers and the Packers went down, and whoopie the Packers won, obviously. If you're alive and live in America you probably know that. But, who did you root for? GO PACK! I'm a Packers fan. But not a real one because honestly I don't care one little bit about foozball. My parents are Wisconsin natives and I think the entire state is filled with my blood! That sounds grosser than it should. 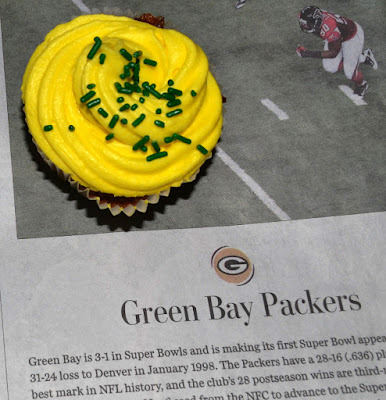 Anyway, I've always liked the Packers. Even though I'm supposed to be a Skins fan, I'm more of a Cheesehead. I can't lie though...I'm not going to pretend to be a diehard. 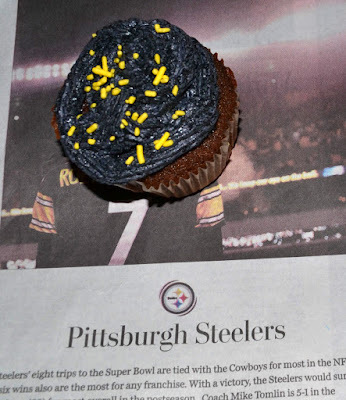 I was more excited about the Green Bay and Pittsburgh themed cupcakes than the game. These are (Martha Stewart's) devil's food cupcakes with a cooked-meringue vanilla buttercream. 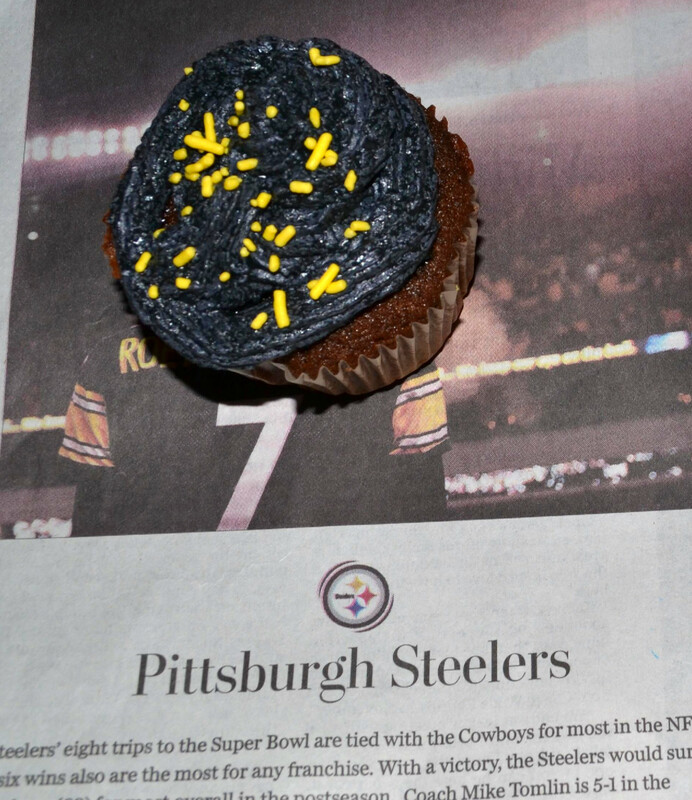 I liked the cupcakes but I loved the frosting. It was light and fluffy and wonderful. And pretty colors! 1. Preheat oven to 350 degrees. Line standard muffin tins with paper liners. Whisk together cocoa and hot water until smooth. In another bowl, whisk together flour, baking soda, baking powder, and salt. 2. Melt butter with sugar in a saucepan over medium-low heat, stirring to combine. Remove from heat, and pour into a mixing bowl. With an electric mixer on medium-low speed, beat until mixture is cooled, 4 to 5 minutes. Add eggs, one at a time, beating until each is incorporated, scraping down sides of bowl as needed. Add vanilla, then cocoa mixture, and beat until combined. Reduce speed to low. Add flour mixture in two batches, alternating with the sour cream, and beating until just combined after each. 3. Divide batter evenly among lined cups, filling each three- quarters full. Bake, rotating tins halfway through, until a cake tester inserted in centers comes out clean, about 20 minutes. Transfer tins to wire racks to cool 15 minutes; turn out cupcakes onto racks and let cool completely. 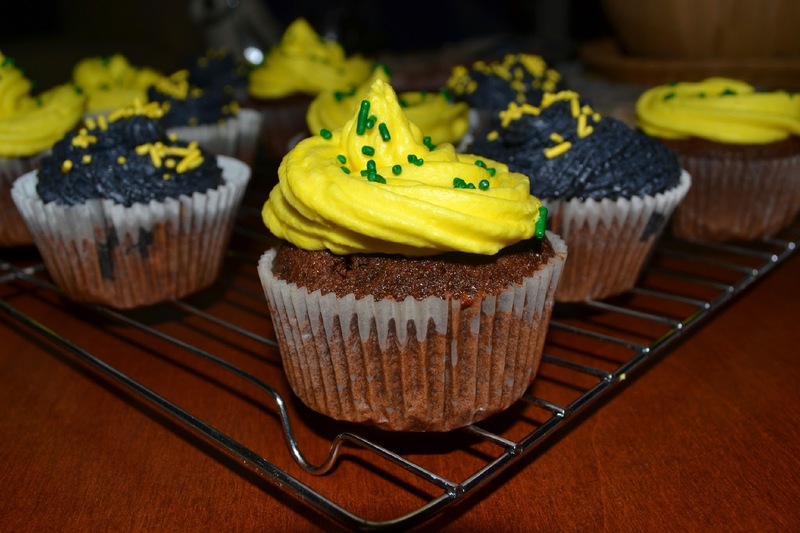 Cupcakes can be stored overnight at room temperature, or frozen up to 2 months, in airtight containers. 1. Combine 8 ounces of the sugar and the water in a small, heavy bottomed saucepan over medium to high heat and cook until a candy thermometer reaches 245F. 2. Meanwhile, whip the egg whites on high speed to stiff peaks in the bowl of a standing mixer fitted with wire whip attachment. 3. Just before the sugar syrup is ready, drizzle the remaining 2 ounces sugar into the egg whites and continue to whip on high speed. 4. In a slow and steady stream, pour the sugar syrup between the revolving wire whip and the side of the bowl. Reduce the speed to medium high after 30 seconds and continue to whip for another 3-4 minutes. 5. Add the butter to the meringue and increase the speed to high to fully incorporate it. Add 1-2 tsp of vanilla and whip until fully incorporated.